It’s been a bumper year of growth at ForrestBrown. We’ve already had several successes at business awards and now our MD and founder, Simon Brown, has been rewarded for his hard work. He’s just won entrepreneur of the year 2017 at the Business Leader Awards. The Business Leader Awards bring together our region’s most influential leaders in business, education and government to recognise and celebrate business success in the South West. Simon faced stiff competition in his category and the other finalists were: James Woollam from Hayes Parsons, Johnny Palmer from SXS Events and Steve Preston from Heat Recruitment. 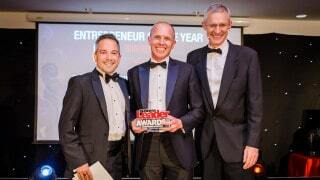 Head over to the Business Leader Awards website to see this year’s other award winners. From a standing start and with no outside investment, Simon has grown ForrestBrown to a 56-strong award-winning firm of chartered tax advisers in just four years. Despite the fast-pace of growth in the company, Simon has managed to retain his original vision for a tax business with a difference. You can read more about Simon’s achievements in the blog we published when he was shortlisted for the award. Simon’s leadership was also recognised earlier this year by the Institute of Directors when he was awarded the IoD South West’s young director of the year 2017 and shortlisted for the national award in the same category. But the ambition isn’t stopping there. We’re continuing to grow as a business and have recently been nominated for three more awards. Keep an eye on the blog and our social channels to see how we get on.